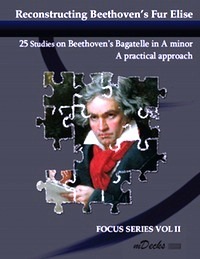 Für Elise, one of the most famous solo piano compositions in music history, written by composer Ludwig van Beethoven which still inspires millions of people to take up the piano, is now available as part of our Focus Series, a practical approach to learning and teaching Beethoven's Fur Elise. Form analysis: Explaining the form of this Bagatelle by Beethoven. Original Score and Bagatelle Variation - At the end of the book, the student will find Beethoven's original sheet music version and a new alternative version, entirely based on the original composition, form and structure, a "What-if-Beethoven-whould-have...?" version.